Contemporary British Folk with a nod to Nashville. ​Once again we ask audiences to join us for a night of upbeat songs, stories and music, and a free “wee dram” as well! Born out of a musical interest in both British folk and the transatlantic connections to new country and Americana, this trio are now fast gaining a reputation across the UK folk scene. ​Their original songs and close three part harmonies are accompanied by guitars, fretless bass, cittern, mandolin and fiddles. This collection of songs and stories trace the long voyages from England and Ireland to The Land of The Brave and Free from the heyday of the Great Atlantic Express liners to the present day. Emigrating families took the music and malts of their homeland to the melting pot of the new world. ​We celebrate this mix of culture and change through a century of crossing the great Atlantic. Kate Bramley, Simon Haworth & Kari Macleod are three singer songwriters with eclectic and diverse roots yet somehow they seamlessly come together to create an utterly original and joyful sound. ​From haunting ballads to swinging country, celtic roots to driving folk choruses, this band are guaranteed to show audiences a good night out. - Kate Bramley best known as fiddler and vocalist touring internationally for Jez Lowe & the Bad Pennies, & folk-bluegrass fusion band, Sweetgrass, (Montana, USA). - Guitarist and singer Simon Haworth (Fellside Records) toured internationally with Jez Lowe & The Bad Pennies, & with BBC Radio 2 Folk Award winner Carlene Anglim. - Kari Macleod is a virtuoso fiddler, unique singer and Americana-style songwriter originally from Tain, Ross-shire, now based in Newcastle. Join us for a night of upbeat songs, stories and music, and a free “wee dram” as well! 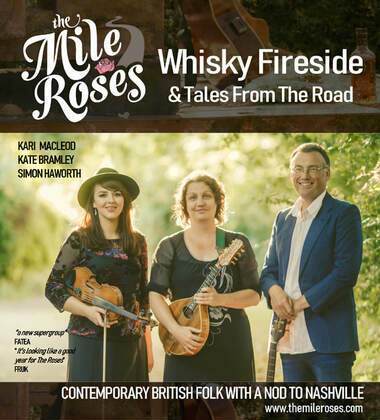 Join The Mile Roses for an upbeat musical evening of songs of the road well-travelled and songs of single malts. It’s contemporary British folk music with a nod to Nashville featuring soaring three-part harmonies and a blend of guitars, fretless bass, mandolins and fiddles from Kate Bramley, Kari Macleod and Simon Haworth.